This intensive three-day course is aimed at scientists who work in the six BIST centres, the Centre for Genomic Regulation (CRG), the Institute of Chemical Research of Catalonia (ICIQ), the Catalan Institute of Nanoscience and Nanotechnology (ICN2), the Institute for High Energy Physics (IFAE), the Institute of Photonic Sciences (ICFO), and the Institute for Research in Biomedicine (IRB Barcelona). “This initiative facilitates entrepreneurial training to our researchers by providing the tools and insight necessary for bringing new ideas to fruition in an interactive and interdisciplinary context,” highlights Pablo Cironi, head of the Technology and Business Development Office at the CRG. 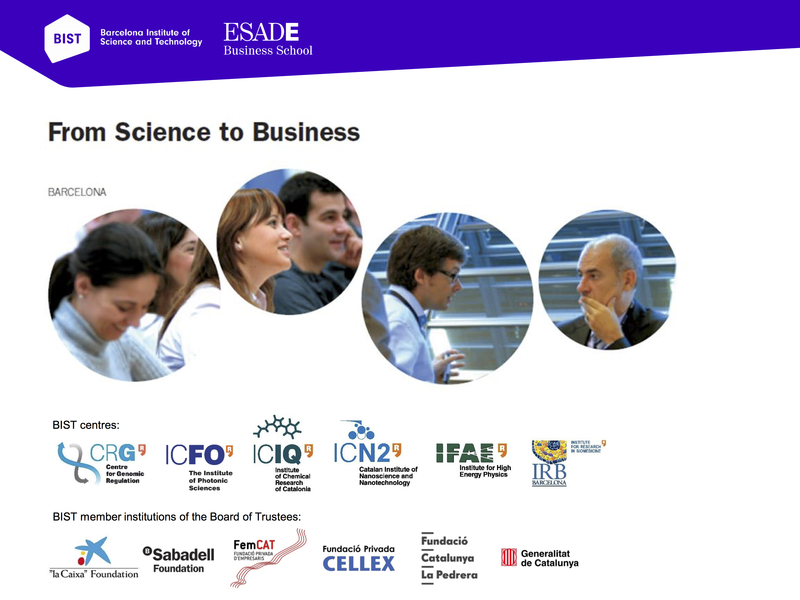 “From Science to Business” will take place from 31 May to 2 June at the Pedrables Campus of the ESADE Business School, in Barcelona. It aims to increase the speed of turning innovation and knowledge into ventures. It willl get researchers acquainted with the business world and provide understanding on how companies work or how is the new venture creation process. Also, the course will show that new venture creation needs scientists and that entrepreneurship can be an attractive career path for them. Please, feel free to discover more about the course here.